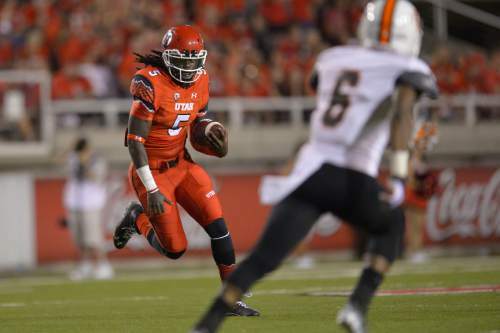 Utah football notes • Cox, Huntley shine while Williams rests. Chris Detrick | The Salt Lake Tribune Utah Utes quarterback Brandon Cox (5) throws the ball during a practice at Rice-Eccles Stadium Tuesday April 5, 2016. Chris Detrick | The Salt Lake Tribune Utah Utes quarterback Brandon Cox (5) throws the ball during a practice at Rice-Eccles Stadium Tuesday April 5, 2016. Chris Detrick | The Salt Lake Tribune Utah Utes quarterback Brandon Cox (5) throws the ball during a practice at Rice-Eccles Stadium Tuesday April 5, 2016. Chris Detrick | The Salt Lake Tribune Utah Utes quarterback Brandon Cox (5) runs the ball during the second half of the game at Rice-Eccles stadium Thursday August 28, 2014. Utah defeated Idaho State 56-14. 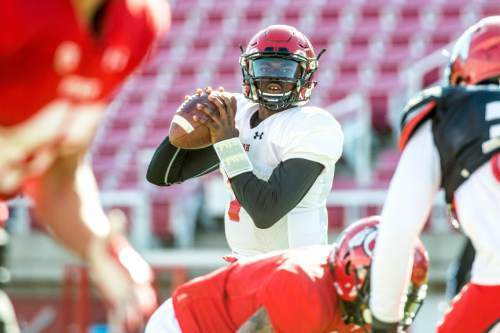 Chris Detrick | The Salt Lake Tribune Utah Utes quarterback Tyler Huntley (1) passes the ball during a practice at Rice-Eccles Stadium Tuesday April 5, 2016. 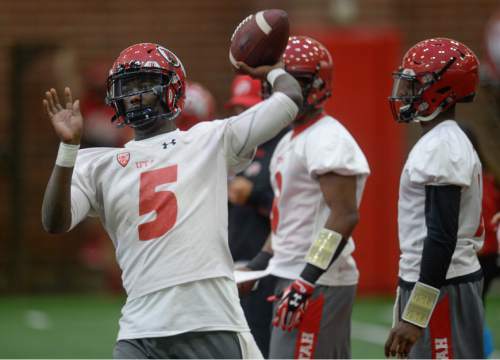 Chris Detrick | The Salt Lake Tribune Utah Utes quarterback Tyler Huntley (1) passes the ball during a practice at Rice-Eccles Stadium Tuesday April 5, 2016. 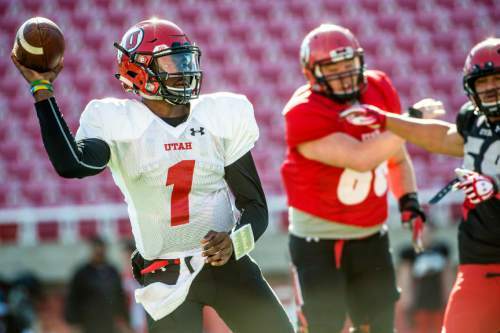 Chris Detrick | The Salt Lake Tribune Utah Utes quarterback Tyler Huntley (1) runs the ball during a practice at Rice-Eccles Stadium Tuesday April 5, 2016. 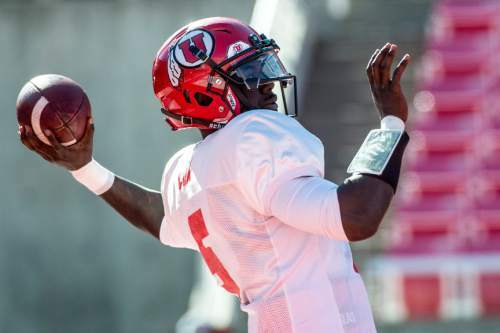 Chris Detrick | The Salt Lake Tribune Utah Utes quarterback Tyler Huntley (1) passes the ball during a practice at Rice-Eccles Stadium Tuesday April 5, 2016. Francisco Kjolseth | The Salt Lake Tribune Quarter back Brandon Cox finds his target as the University of Utah football team kicks off opening day of spring practice on Tuesday, March 22, 2016. 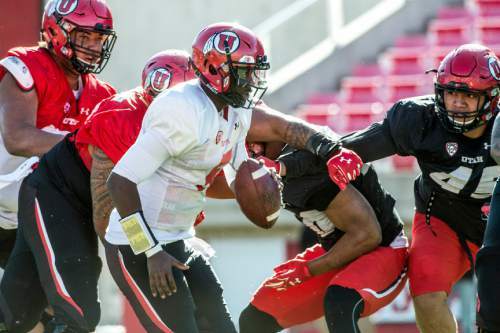 Francisco Kjolseth | The Salt Lake Tribune Quarter back Troy Williams finds his target as the University of Utah football team kicks off opening day of spring practice on Tuesday, March 22, 2016. Chris Detrick | The Salt Lake Tribune Utah Utes quarterback Brandon Cox (5) runs the ball during a practice at Rice-Eccles Stadium Tuesday April 5, 2016. 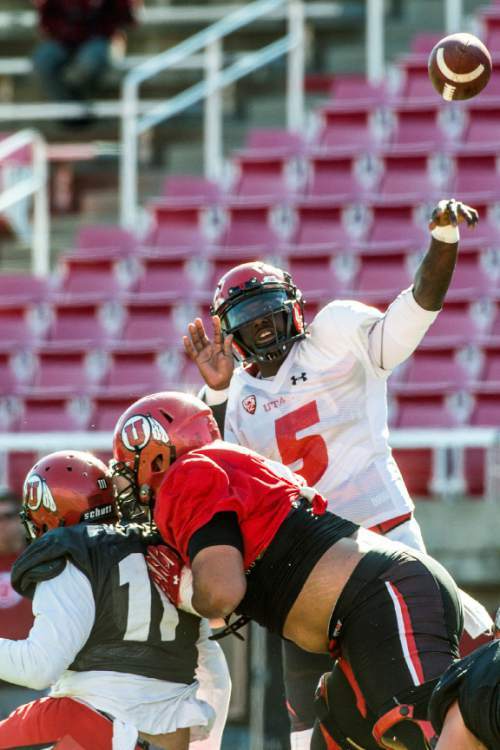 On Tuesday afternoon, the Utah quarterback battle had thinned down to two  but not by choice. 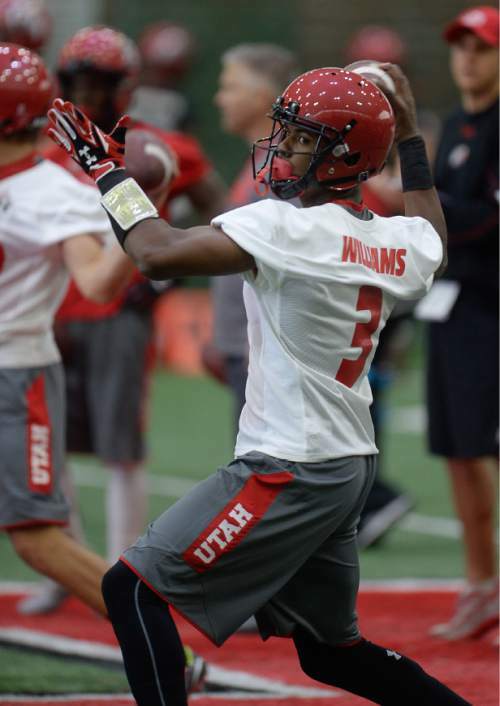 Junior transfer Troy Williams watched from the sidelines, fully suited up, as his competitors junior Brandon Cox and freshman Tyler Huntley took snaps and enjoyed a little more success than the Utes offense has had in the first two weeks. One of the top contenders for the job, Williams was held out of several portions of practice with an unspecified injury. 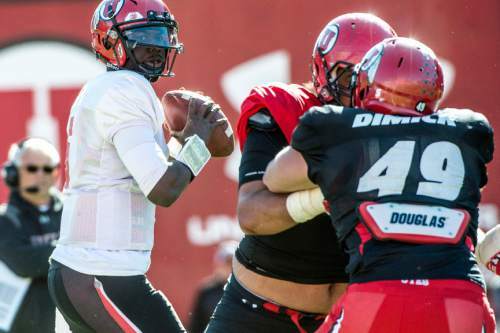 While coach Kyle Whittingham insisted the QB race is still a "dead heat" and he&apos;s trying to divide reps up evenly, it&apos;s clear he would like to see Williams back. "They&apos;re doing well, but we have to get Troy back," he said. "That&apos;s something that absolutely has to happen soon." In the meantime, the other two tried to gain ground. Huntley found a bit of a rhythm throwing the ball, moving the offense down the field in the final full-team drill period. But some of his receivers didn&apos;t help him with drops on contested balls, and Huntley erred himself in making an ill-fated option toss to Joe Williams, which was recovered by the defense. Cox was hit-or-miss at times in the passing game, seeming at times to struggle with leading receivers too far or throwing behind them. But he hit one of the longest passes of the day downfield to Tyler Cooperwood. He also had a touchdown toward the end of practice on a quarterback sneak. The first to jump up and congratulate Cox on the score? Huntley. 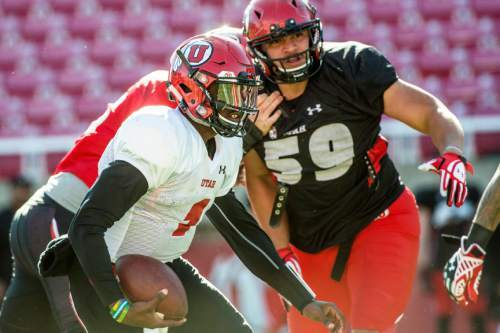 In all, the offensive line that has been beaten down for much of spring looked fresher and tougher than it has, leading Whittingham to call it probably the best practice for the offense so far. "The protection has gotten steadily better," he said. "The first two or three practices, it was not good at all. Each practice subsequently has been a step in the right direction." A relative newcomer to the corner position, senior Brian Allen hasn&apos;t always been the most consistent performer in the secondary. But at 6-foot-3 and 205 pounds, he&apos;s long been one of the most intriguing athletes there. 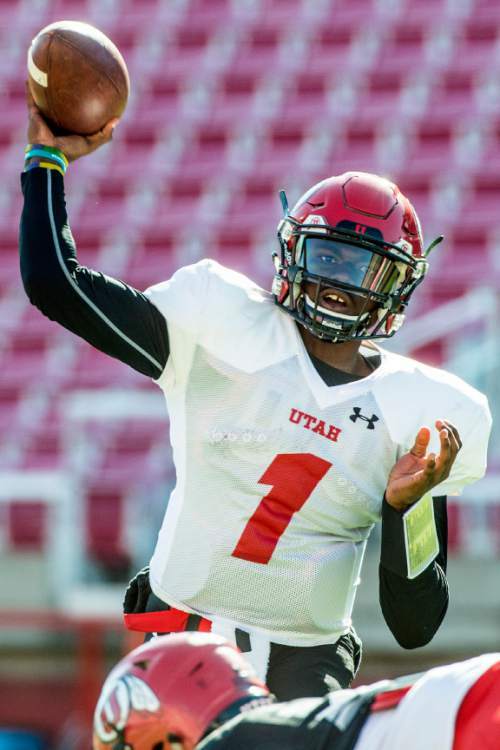 This spring has shown signs that Allen is getting closer to becoming the corner the Utes envisioned when they switched him there two years ago. With several pass breakups on Tuesday and a teeth-chattering tackle on Kyle Fulks, Allen is showing he&apos;s a capable all-around player. "I think he&apos;s starting to use his length in a good way with a couple of PBUs, and a couple of picks," cornerbacks coach Sharrieff Shah said. "I&apos;m really pleased with what he&apos;s doing right now, and he&apos;s dedicated to getting better." Allen had starts last year in Utah&apos;s final three games, accounting for 27 tackles and three breakups during the season. Shah said Allen&apos;s greatest remaining challenge is to become "situationally smarter."